Sometimes conversations on collaboration can get a bit confused. Often because you aren’t talking about the same thing, but without realizing. The concept of collaboration means different things to different people… and at different times. It’s a matter of context. 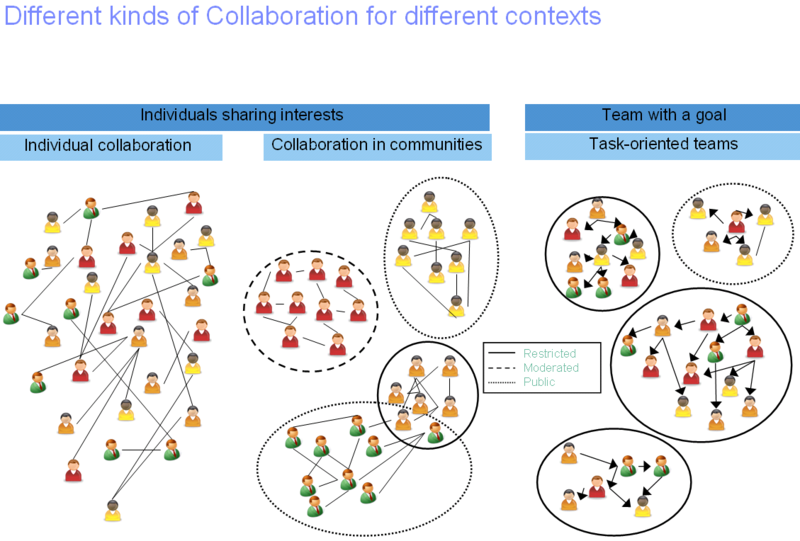 I find it useful to think (and explain) a bit extra about the context of collaboration when discussing with others, but also on my own when analyzing behaviours and observations. The three typical contexts presented here have provided an excellent basis for me (I know it’s no rocket science, but it has proven useful often enough for me to want to share). Usually, I apply this model when talking about intranets, but I think it works pretty well also in public networks. Many tools and features are used in all contexts, but in different ways and with variations of intensity and – definitely – for different purposes. As this context has long been the easiest to understand and assign monetary value, web support was available early, also on a commercial online basis. While this type of collaboration has seen unparalleled success the latest decade in the public arena, it has had greater difficulties to make the same headway within companies and organizations. Quite understandably so, too, at least as long as you think conventionally; structure, purpose, process, measurability, cause-and-effect. In many cases, the public sites for individual collaboration may even have had a negative effect on internal acceptance. “I don’t want to introduce something for my employees to waste their time internally on socializing as they do already on Facebook”. But those of us who have had the opportunity to use rich and comprehensive social intranets are very aware that they pay off. It’s just so darned difficult to present their value in a way that the conventionally minded understand. But there is an increase of communities of interest also in the public domain; groups on LinkedIn and Facebook, by hashtags on Twitter etc. For companies who do not offer similar possibilities internally, I think these public communities represent a major risk of leakage of intellectual property. So, next time the arguments of your discussion partner seem not to make sense, take a step back and spend some time on understanding if you talk about collaboration in the same contexts or in different. Did Steve Jobs worry about ROI? What did the ROI calculation for the iPhone development look like? For the iPad? Or for iPod? I never met Steve Jobs. I never worked at Apple. Still, based on what I’ve read about him I doubt that there ever was an ROI calculation for the investments made in any of Apple’s and Steve Jobs’ breakthrough innovations. He believed and he dared. His compass knew it was the right thing to do. Yet he was the most acclaimed business innovator in the past decade. Next time I’m asked about the ROI of social intranets I will counter with this question: Would Steve Jobs have bothered calculating it? I hope it will go down better than my current standard question of: when did you last see an ROI calculation for implementing SAP? Comparing the investment needed to unchain the potential of the company staff with making an investment in production equipment that can produce faster or more efficiently is nothing short of an insult to the people working for you. Innovations can be classified into two categories: Enabling or Improving. Either they make something possible that was not before – like the automobile once made it possible to travel long distances fast and with a flexible route. Or something currently possible to do easier, more efficient or with better quality – like more fuel efficient cars, safer cars or innovative service programmes. Improvement innovations are suitable for ROI-calculations, enabling are not. – then go back to your archive, pull out that ROI-calculation run it through the shredder and realize that inspiration, collaboration and staff commitment is not to be reduced to numbers. Author TheSocialSwedePosted on October 19, 2011 Categories Social IntranetTags apple, enabling, english, improving, innovation, roi, steve jobs2 Comments on Did Steve Jobs worry about ROI?